Dalhousie University professor Shauntay Grant wrote her latest book on the history of Africville, but there’s a twist. This isn’t your typical research book; it’s a book targeted at teaching children about the community of Africville. Grant, a Nova Scotian writer and assistant professor in the Dal English department wrote her new book about a young girl who goes to visit the historic town of Africville. As the girl walks through the site, she recalls the stories that her family has told her about their happy memories living in Africville. This excerpt is taken from Africville, text copyright © 2018 by Shauntay Grant, illustrations copyright © 2018 by Eva Campbell. Reproduced with permission from Groundwood Books, Toronto. www.groundwoodbooks.com. Grant got into children’s writing somewhat by accident. Years ago, she was invited to read a poem at an event held by the Writers Federation of Nova Scotia. By chance, the senior editor of Nimbus Publishing was in the crowd; after hearing Grant’s poem, the editor told her that it should be made into a children’s book. Poetry and children’s writing aren’t the only forms Grant writes in. She makes music, performs spoken word and even has a play about two brothers living in a rural Black community in Nova Scotia. The play is with 2b theatre company and debuts in 2019. Although Grant writes in many forms, she says there is a common thread that ties her work together. “No matter what genre I’m writing in, I’m a poet,” she says. Most of Grant’s children’s books are based on poems that she wrote. Africville is based on a poem that she penned at the Africville site when she visited the museum one summer. But this poem did go through some changes before being published as text in the book. Before finalizing the text and pictures, Grant asked her publisher if she could show the draft of the book to former Africville residents. After this process, Grant and her illustrator, Eva Campbell, had to tweak some details to accurately represent the town as it was remembered by its residents. But that did not bother Grant. Grant hopes that her book will be used as an education tool for a child audience. Grant hopes her book can change that. She’s glad to contribute something to the literature on Africville. Only a handful of books on the topic have been written for children. Grant also wants her readers to know the side of the story that’s never really been told. The history of Africville is often seen as a dark and shameful part of Nova Scotia’s history. The terrible treatment of the town’s residents is a point of guilt and shame for the Halifax government and people. Grant didn’t want children to see Africville in only a negative context. 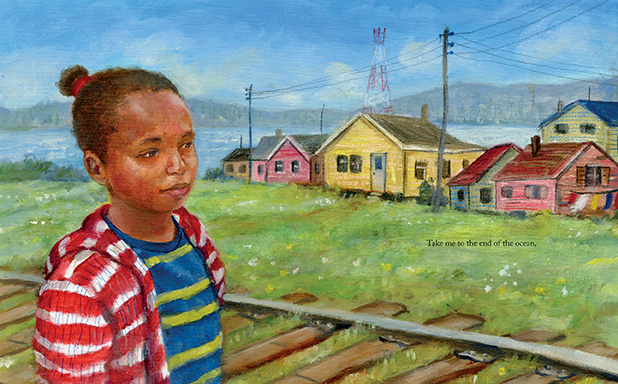 Grant’s book celebrates Africville in a way it has rarely been seen before: a place of happiness. ← A new way to get help?